Nevertheless, I have tried to make an overview of the current plan. 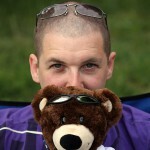 It might change in the coming weeks, as we are in the middle of arranging our visas. It will definitely change once we get going. The first stretch through Europe will be mainly fast and easy roads through regions we have mostly already visited in the past, avoiding motorways where we can. The idea is to lose as little time as possible to get to the regions which are new and exciting to us. Originally we had planned to ride through Ukraine to visit Odessa, cross into Crimea and then Russia to get to Georgia. But due to the political situation and the potential administrative complications, in the end we decided against this in favor of a route through the Balkans. It will be pretty much A-roads until we reach Bosnia & Herzegovina, with a couple of mountain passes through Austria, Northern Italy and Slovenia. 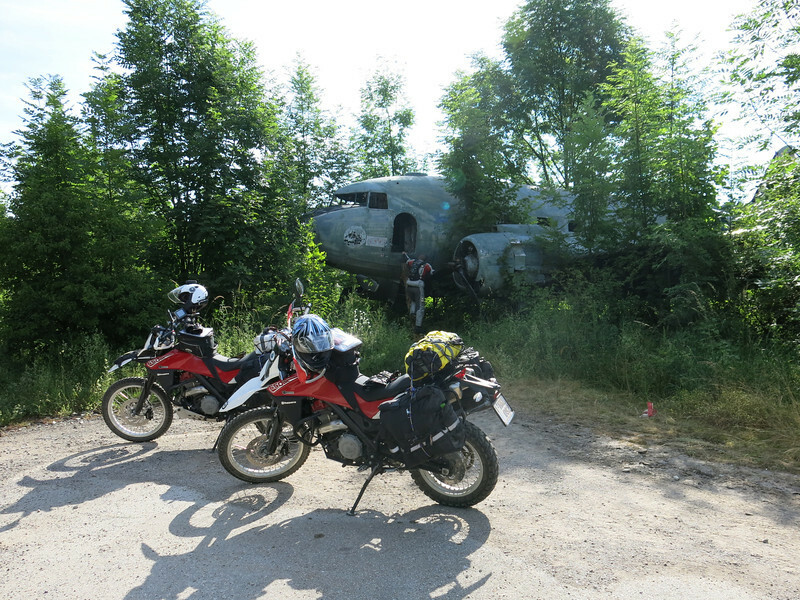 We may have another stopover at Zeljava airport on the Croatia/Bosnia border. Just to see how much has changed over the past 2 years. From there Bihac isn’t too far away and conveniently located to change some Bosnian Marks. The route across Bosnia itself will be a bit of on-the-spot improv with likely a mix of some known and some new. One place we definitely don’t want to miss is Srebrenica. Due to time constraints we had to pass it by the last time we were in the Balkans. But it will definitely be a good spot to put all our precious “European values” into perspective before venturing out into the rest of the big scary world. Just across the border in Serbia, we are looking forward to riding through Tara National Park. Serbia will also be the first country on our list that we haven’t visited yet. So very excited about that as well. The plan is to make our way across central Serbia towards the Danube river that forms the border with Romania. We’ll follow the river south and enter Bulgaria. We hope to enjoy more of the twisty mountain roads the Balkan Mountains have to offer north of the capital Sofia, making our way east towards Buzludzha. One of the locations on both our bucket lists, and unfortunately in very bad shape due to the Bulgarians having difficulties coming to terms with the soviet past. From there we’ll need to turn south towards the border with Turkey. The first major milestone for us in Turkey will be the crossing of the Bosporus, exiting Europe and entering Asia. Neither of us are big fans of large cities, so we’re not sure yet whether we’ll be diving into Istanbul proper. We do enjoy beautiful vistas and imposing landscapes so through central Turkey the front wheel will be pointed decidedly towards Cappadocia. Hopefully we’ll have the opportunity to go into full-on tourist mode and catch a hot air balloon ride. Enjoying the rest of the Turkish countryside traveling further east and perhaps visit a few beaches on the Black Sea coast before crossing the border with Georgia. Georgia should prove interesting, with its strange alphabet. There will be plenty to see and visit as well: the Caucasus mountains, Gori (the native village of Joseph Stalin), interesting national parks and the military road towards Russia with some regions just across the border that we only know from the news, like Inghusetia and Chechnya. We probably won’t be able to take it all in, but we’ll definitely give it the good old college try. From Georgia we’ll have to travel straight south into Armenia, a country we would not be able to enter from Turkey directly, or from its other neighbor Azerbaijan for that matter. International relations in this region aren’t exactly friendly. 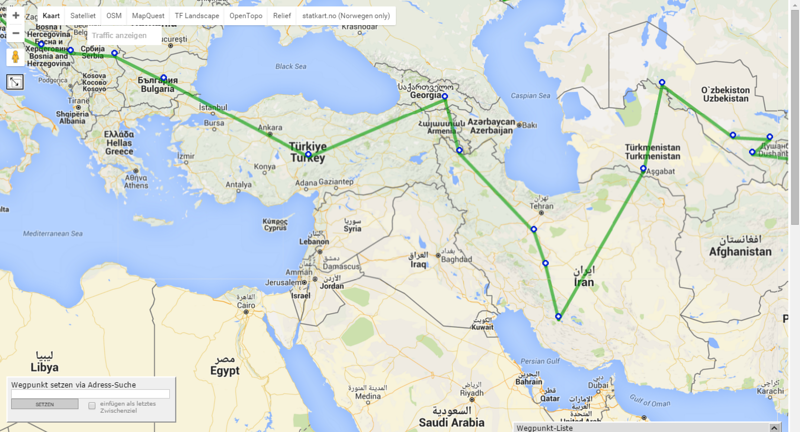 So we had to make a difficult choice for our route to Iran. In the end we opted for the possibility of visiting the many monasteries of Armenia and getting a view of Mount Ararat. Not having to source visa also helps, of course. Then it’s on the the Islamic Republic of Iran. If we were to believe our politicians and press we’ll be entering the root of all evil and will surely get killed. But fortunately we have good and trustworthy friends who have actually been there and convinced us that Iranians are the most warm and welcoming people in the world. 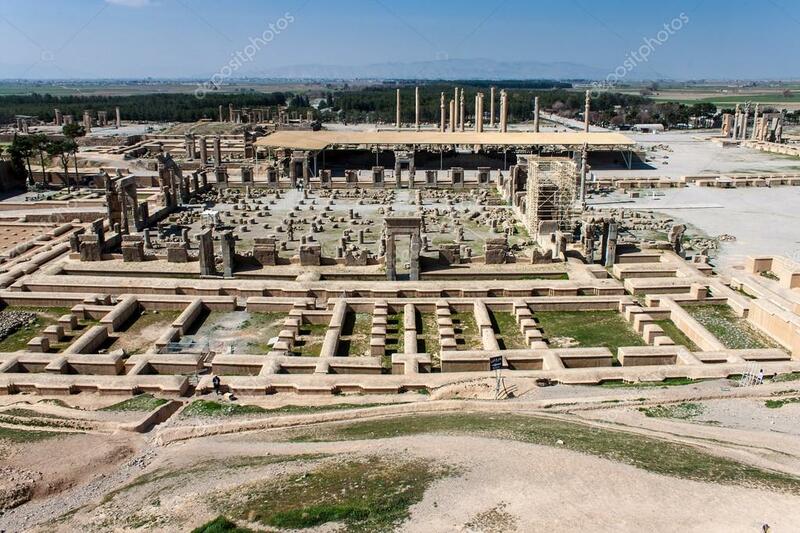 We hope to be able to return that love and meanwhile visit some amazing places in Isfahan, Shiraz and Persepolis. We definitely plan to take our time to visit the country. And chances are we’ll be spending some of that time experiencing Ramadan. 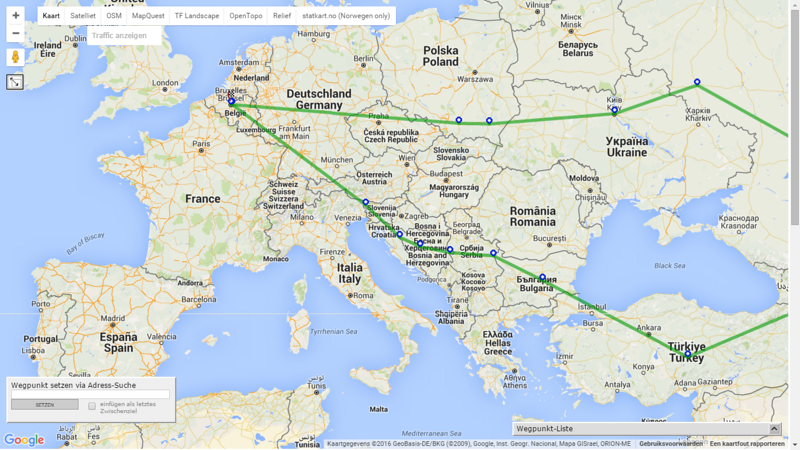 The next country on our planned route is a bit of a wild card, and a risk. Getting visa for Turkmenistan is far from easy and we’ll have to be content with 5-day transit visa, if we get any at all. If it doesn’t work out, our alternatives are limited. Either we cross Afghanistan towards Uzbekistan or we backtrack and make an almost 5000km detour around the Caspian Sea. Neither of which is a very appealing prospect. So let’s hope our visa application goes smoothly. 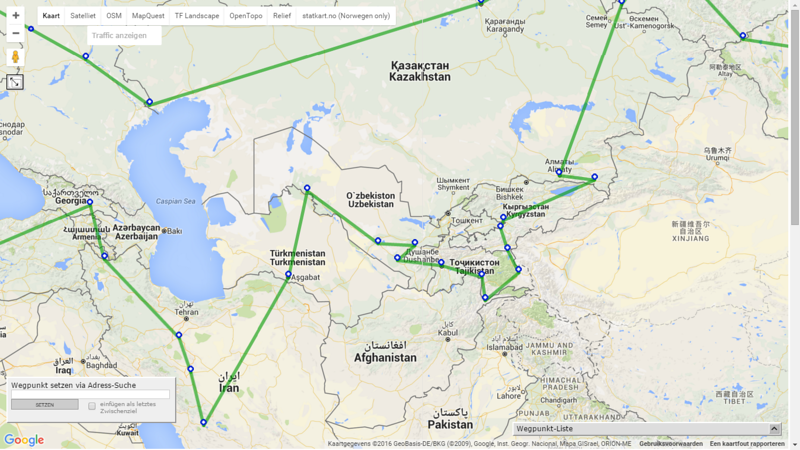 Given the limited time we would have in Turkmenistan there is little we can see or visit. Uzbekistan is an entirely different matter. There’s many silk Road cities to admire, but first we hope to take a look at what used to be the south Aral Sea. After that the route of the ancient silk road will bring us to exotic cities like Khiva, Bukhara and Samarkand. If we manage to leave all that history and culture behind we’ll enter into Tajikistan and some of the highest roads of the entire trip. The roads through the Pamir Mountains will undoubtedly be a highlight. We have a number of options to cross them. The Wakhan valley, along the Afghan border, and the Bartang valley, further north, are both very appealing. The main Pamir Highway is an option as well, although probably less interesting. In any case, the route from Dushanbe to Murghab will be challenging and interesting. Next up is Kyrgyzstan which would make a great destination in itself, especially considering you could fly there from most major airports in Europe without even needing a visa. The landscapes should be just as exciting as in Tajikistan and hopefully we’ll even be able to get a view into China before we reach lake Issyk-kul in the north. 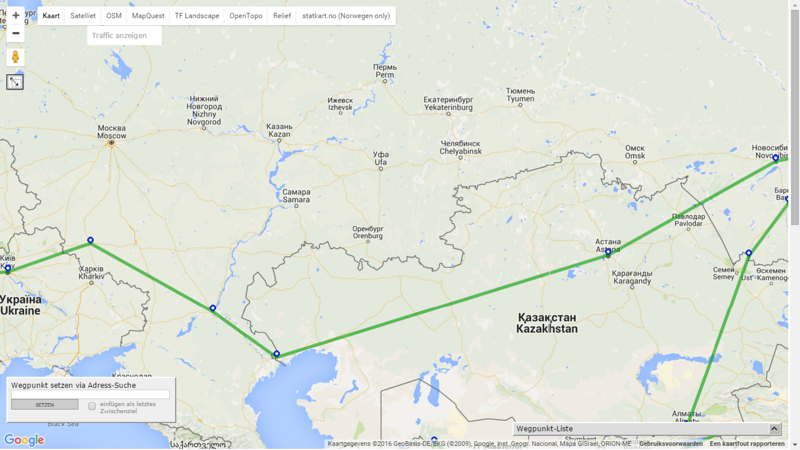 There are a number of possible border crossings into Kazakhstan, but the most appealing to us is the one near Kegen. It would allow us to visit one of the most famous landmark features in the entire country (which is big): Charyn Canyon, the Central Asian alternative to the Grand Canyon. We might pop into Almaty, the capital of the country until 1997, when it was moved to Astana. After that it is on to explore the Kazakh steppe on our route north towards the Russian Altai region. The Altai is probably one of the parts of our trip that we are most looking forward to. Supposedly it is one of the most beautiful natural landscapes in the whole of Russia. So we’ll try to spend some time exploring the mountains and lakes. From here on, the route is even more vague. A lot will depend on how much time we’ll have left. If the schedule permits we’ll definitely cross the border into Mongolia. If not, this is where our return trip will start. 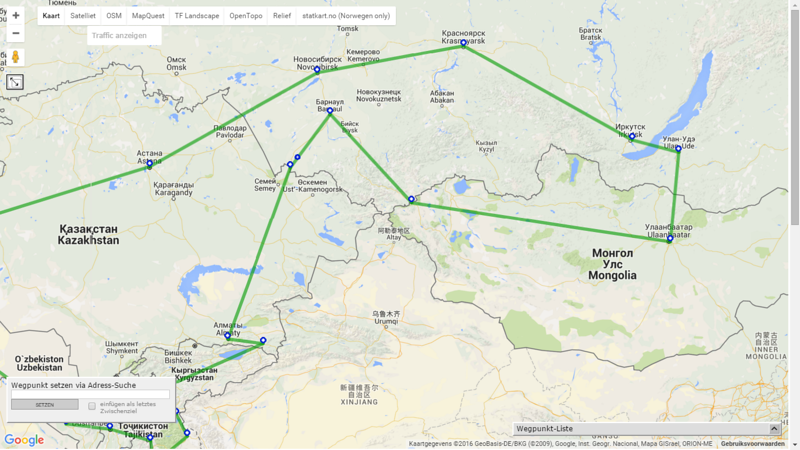 But assuming we’ll go into Mongolia there are a number of route options, through the north, through the south past the Gobi desert or a less obvious central route. The choice will depend mainly on weather and the water levels of the rivers we might need to cross. 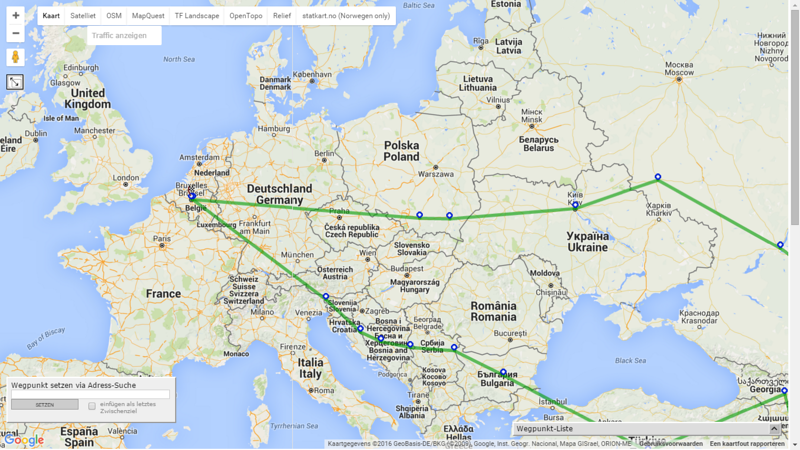 Whichever route we take, it will pass through the capital Ulaanbaatar. From there we can go North towards the Russian border and Lake Baikal beyond. If we make it that far, we plan to try and travel a stretch on the Transsiberian Railway, from Irkutsk on the shores of Lake Baikal to Novosibirsk. From there we can visit Astana and cross the Kazakh steppe towards Astrakhan, hopefully getting a view on Baikonur on the way. Once we have crossed back into Russia it will go on to Volgograd (formerly known as Stalingrad), then Kursk and on to Kiev in Ukraine. Nothing much exciting to report on our route back through Europe. It will be pretty much a straight line through Poland, the Czech Republic and Germany, already familiar terrain from previous trips. At least, all of the above has been the plan so far. We have been continuously receiving information and tips from various sources that already make us reconsider some of the plans in favor of other sites and traveling slower, maybe skipping some parts we had originally planned. Only time will tell.